We’ve been busy, busy bees! Over the weekend we made sure we had pictures of everything, and updated our business cards and portfolios. Check out some of my favorites. 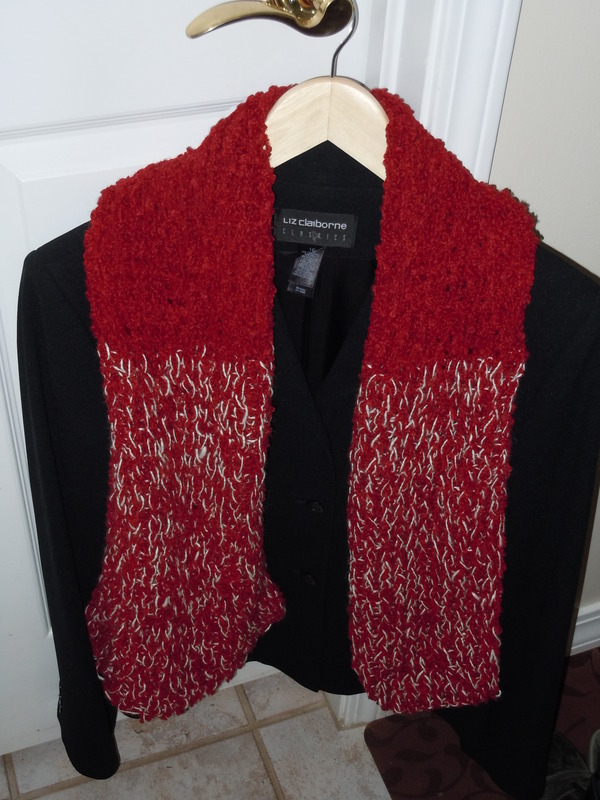 One of Mom's thick, warm baby alpaca scarves. Baby alpaca yarn is wonderful, and Mom knits the thickest, warmest scarves from it. She uses a loom, so the stitch is quite different from most knit scarves. I sorta invented this one as I went, not sure what I think of it. I took the time to crochet something last week. 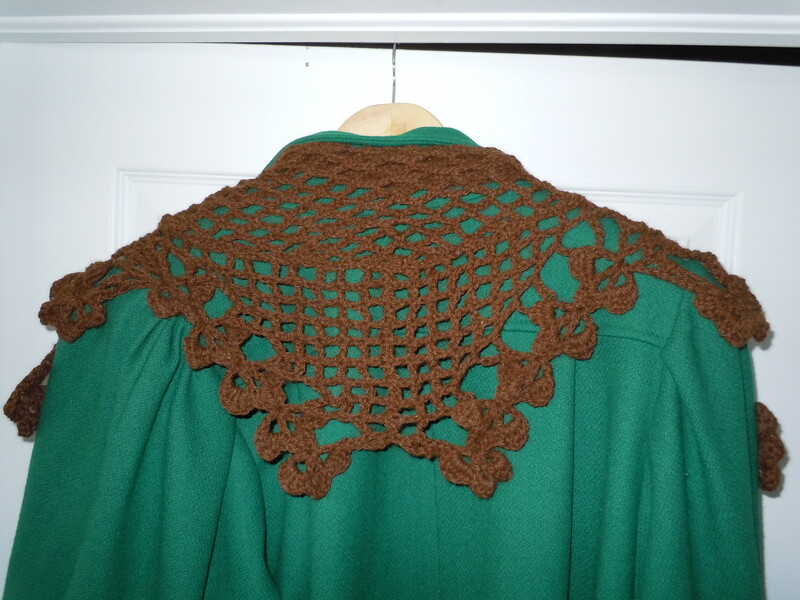 I haven’t really done anything but spin in ages, so this kind of shawl thing was a fun side project. I only had one skein of alpaca yarn from our friend’s alpacas, so I had to make something up. One of my most recent yarns. We call this one Christmas Tulips. 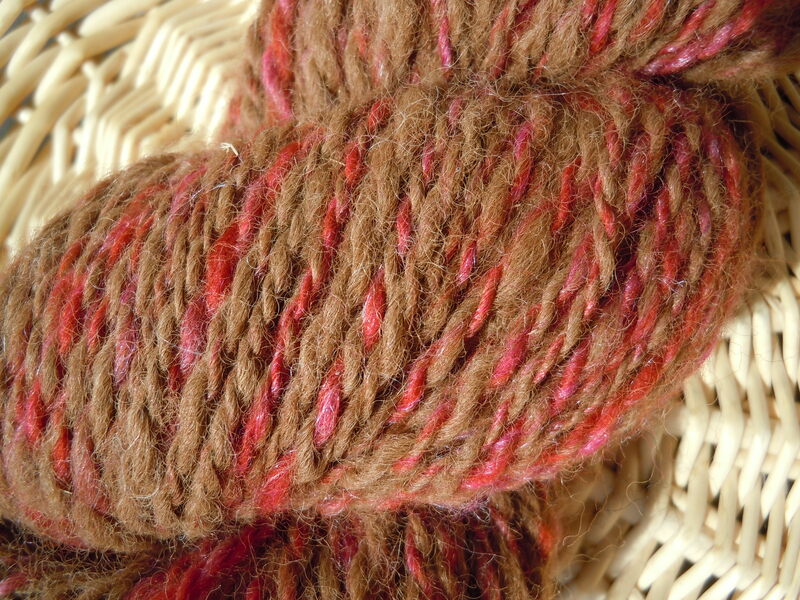 I buy the red merino roving and then mix it with Tulip’s fiber. We have white alpacas (Tuscany, Morocco, Merlin and Bravado), but I haven’t started dyeing yet. This entry was posted in business, fiber art and tagged alpacas, art yarn, crochet, hand spinning, hand spun, knitting, spinning, yarn. Bookmark the permalink. I like your invented prayer shawl. Would like a larger,longer version. Definitely. I’m working on one that is more triangular and should be much larger. I’m using my own yarn (for the first time!) so when I ran out, instead of modifying the design, I just spun more! Thanks!! My mom and aunt are super talented. I just spin, usually. I will certainly kiss the livestock for you! Little Brittany loves kisses.